Live healthy and be happy? All for the low, low price of...nothing? Sound too good to be true? Stay tuned, and find out how you, too, can win! We’re only in week three of our journey. Yikes. What, you may ask, is the “No Impact Experiment?” And who, you might wonder, made it official? As a writer, Beavan began blogging about the experiment and still continues to share his thoughts and actions via blog: www.noimpactman.typepad.com. He’s living every writer’s dream--his blog became a book, the project became a documentary, and now he has launched the No Impact Foundation. 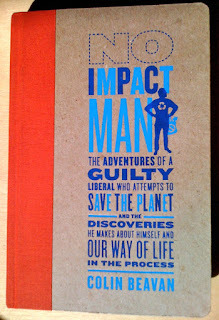 This guy doesn’t just “talk the talk.” He is the poster boy for environmental goodness. Anyway--Beavan’s journey prompted our family’s year-long experiment: “No Impact Man-Lite,” as I lovingly refer to it. I read his book during the first week of our project and found many ideas our family will adopt...and some that just aren’t going to happen. We’re not going to give up toilet paper, we logistically can’t eliminate driving, but there are plenty of ways to turn our negative habits into positive ones. Wow. Not sure if we’re ready for this, I thought, when I read about the launch of the experiment. But as I read deeper into the website, I remembered words of wisdom from two of my friends. While I was beating myself up over the purchase of a drink in a styrofoam cup yesterday, my friend Jessie reminded me that I don’t have to eradicate my carbon footprint overnight--it’s a journey. And my insightful friend Dana, who was part of the wine sampling Friday night, mentioned how much difference we could all make if we just reduced our consumption by 10%. Ten percent? That’s not hard. You barely feel 10%. The official launch is this Sunday, October 18. We’re going to try it, and I’ll be writing about our progress...and the things that challenge us.